Your time is the most valuable asset. Therefore, how important it is for you to know how much of it you spend on your work? Or most importantly, how do you tell if you are spending too much time on minor tasks while not putting enough time into tasks that actually move the needle? If you are a freelancer, or even just working on a project that is billed hourly it’s important to have a simple solution for tracking billable hours. Same goes with project managers who find it important to keep track of the time their employees spend on the ongoing projects in order to understand where things are getting slowed down, and what tasks need to be optimized or pushed forward. While at the end of a day we are all in a pursuit of becoming productivity masters, it should be important for us to know how productive we actually are. Tracking the time we spend on our activities is what will bring us closer. So, it’s good to back yourself up with an efficient time tracking tool that will make you able to track the time you put into your work and to see where all that time goes. Here is where we’ve compiled the list of different tools that will help you track the time spent on your tasks and projects so you can work on improving your productivity. 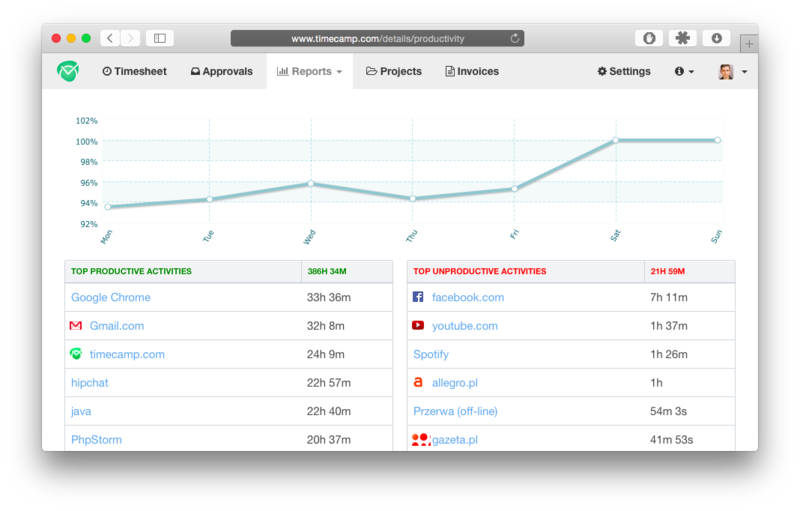 Let’s start with Toggl – it puts time into any web tool and it allows you to track your productivity. What’s great about it is that it tracks time right from inside dozens of other apps you use when working on certain tasks It lets you track the time for your entire team and for multiple projects. But the real deal is how it puts all the data to work for you. You can organize your timesheets by project, sub-project, and billable/non-billable entries, use color-coding and tags to make everything easy to recognize. All this data is stored in Toggl’s dashboards showing you graphs of where your time went, how much your billable hours are worth, and who in the team was most productive. You can also export your timesheets into PDF reports, and share them via email to send them to your clients. When using it as a browser extension, it let’s you track the time you spend on any tasks as simple as possible – with a single click on the Toggl button in your browser toolbar. It will ask you to type in the task you are about to start working on and it will start timing your work. Pricing: Toggl Chrome extension is free. Business plan ($59 per user per month), Pro plan ($10 per user per month), Pro Plus plan ($20 per user per month). Another tool called Yast promotes itself as the world’s easiest time tracker, and it certainly is up there. It lets you time your work with a single click timer, making it possible for you to enter the time before or after you do something. You can use it to track the time for multiple tasks and projects that can be organized in folders and visualized in color-coded timelines. This is how Yast helps you to see at a glance where all your time goes. It will also show you the total and subtotal time for any project, task, day or the week. The great thing about Toggl is that it comes with collaborative features that let you share your timers and task folders with your coworkers. So everyone in your Pokemon Go crew can keep tabs on effort…Or, on the other hand, your colleagues may not find that amusing. Maybe not for private tasks! To be able to make the data work for you, Yast lets you print reports for any project, task or period whether by the user or the entire team. All in all, you can administer it with an ease and access it from any device as long as you have internet. CloudTimr comes as a cloud app that allows you to track the time you spend on your daily activities, even when the application or your device is turned off. So, any time you log back in, you will still be able to see how much time has elapsed while you were busy working. CloudTimr lets you organize as many tasks as you want in multiple groups using hashtags, thus making it easy to manage all your work. You can also choose to train your productivity skills by setting time goals for your tasks, while getting real time notifications about your progress. It works as a multi-platform, accessible from all your devices! To be able to optimize your time, you still need to understand where most of that time goes,which is why CloudTimr also allows you to access your data with its data visualisation. You can also export your tasks as a .csv file. If you are an individual focused on tracking your own time and progress, CloudTimr will back you up with all the essentials, but it doesn’t come with collaborative features that would let you track time with the team of coworkers. 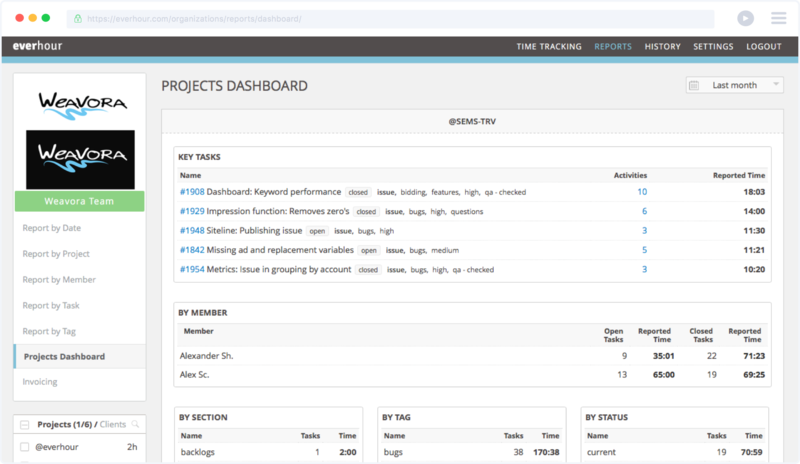 Everhour is trying to bring that ever missing time tracking feature inside your favourite project management tool. 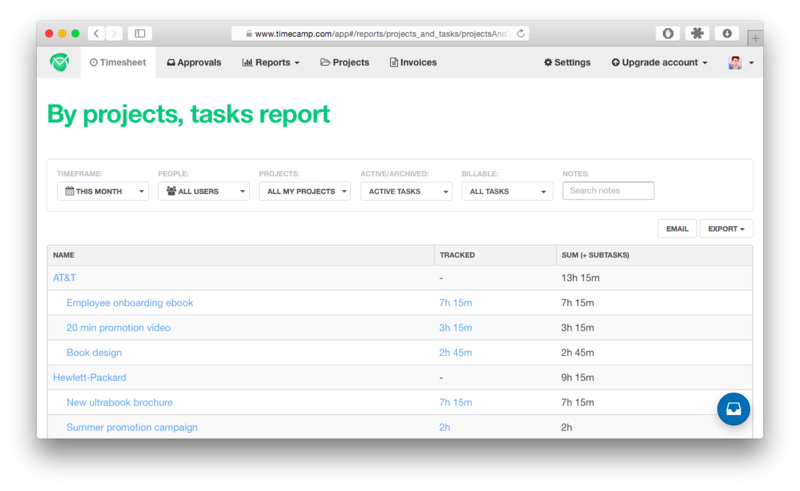 It is a time tracker that embeds directly into project management tools such as Trello, Pivotal Tracker, Asana, Github, Basecamp. 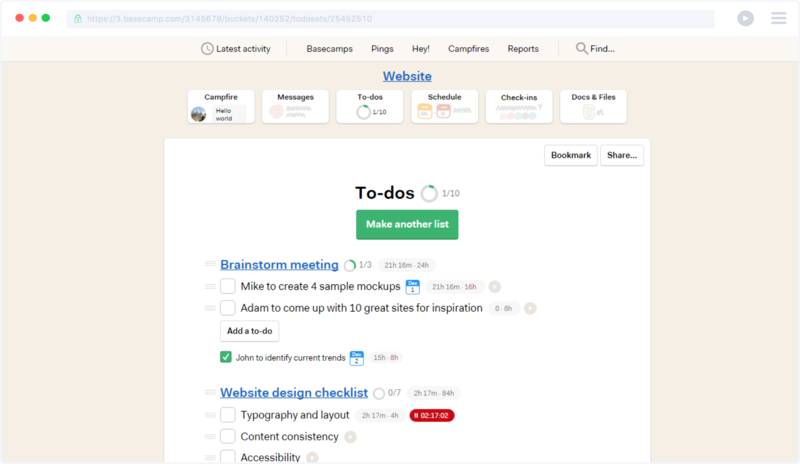 To enable use, all you need to do is sign up, and it connects with your project management tool and installs the Everhour Chrome extension. Using its extension will also let you time your tasks with a single click without leaving the page you are currently being on. 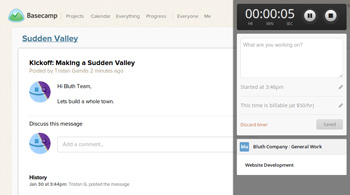 From there you’ll be able to time tasks from your team’s projects whether using a timer or with a manual entry. You will also be shown a total time spent on certain tasks or projects. It even lets you see and compare estimates vs. your remaining time. What’s even better is that it comes with an integration with Xero and Freshbooks that allows you to easily invoice your time and projects. This one still gives you the insights into where your time goes, but what makes it specific is that it only lets you track of how much time you spend on various web sites. Time Tracker is a fairly simple solution that comes down to tracking the time with a single click on its icon inside the browser toolbar. 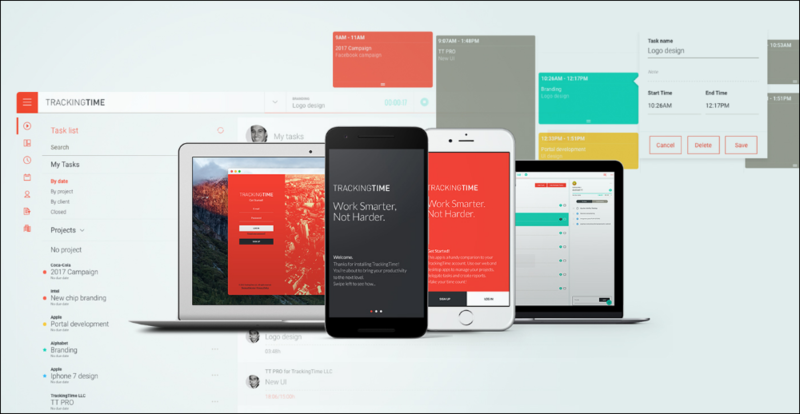 Designed for founders, project managers and freelancers who want to make the most out of their time, Tracking Time allows you to stay organized while effortlessly keeping track of your working hours in real time. Because the app also focuses on collaboration, you’ll be able to organize your clients, projects and tasks on your dashboard while seeing the work being done by others on your team. With real-time updates, comments and notifications built-in everyone on the team can stay on the same page. Additionally, you’ll never have to write out a timesheet again, as Tracking Time creates in-depth time analytics and performance reports automatically. 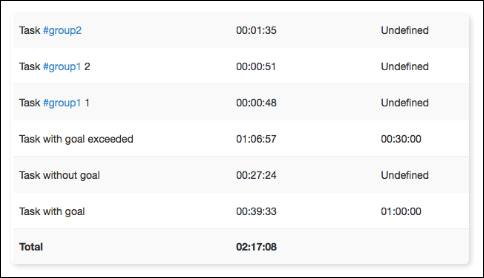 Tracking Time is also designed for global teams as its system is localized for English, German and Spanish. Paydirt scans the pages you visit for the unique keywords that are related to the clients you are working for – That might be their business name, website, or email address, depending on what you decide to set as a keyword. When it finds one, it matches it with the respective client and it prompts you to start a timer. It lets you track your time from any web page or web app. Whether you’re working on your client’s website, sending him an email with Gmail, running a project in some of the project management tools, managing your client’s social media accounts, writing in WordPress, or researching on Google. It practically works wherever you do and it tracks the time where you need it. Pricing: Free 30-day trial; From $8-16/mo for single users (up to 3); From $29/mo for teams. Harvest stands as a standard solution for tracking time whether from Chrome or from within popular project management tools such as Basecamp, Trello, GitHub. 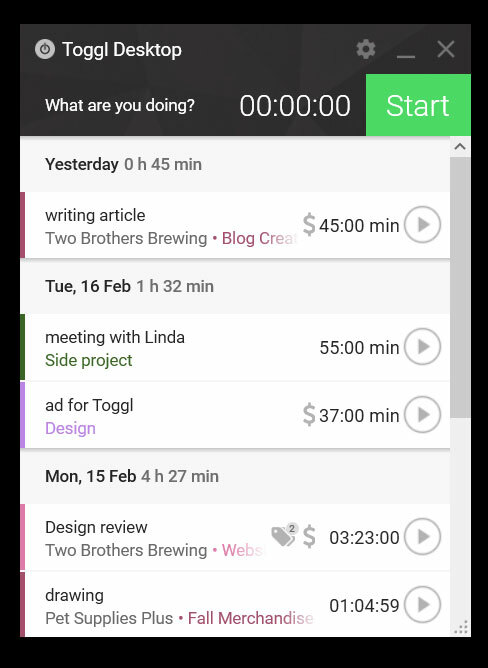 For example, when using some of these project management tools in Chrome, you will be able to see an option to start timers on any task and to-do item inside of it. 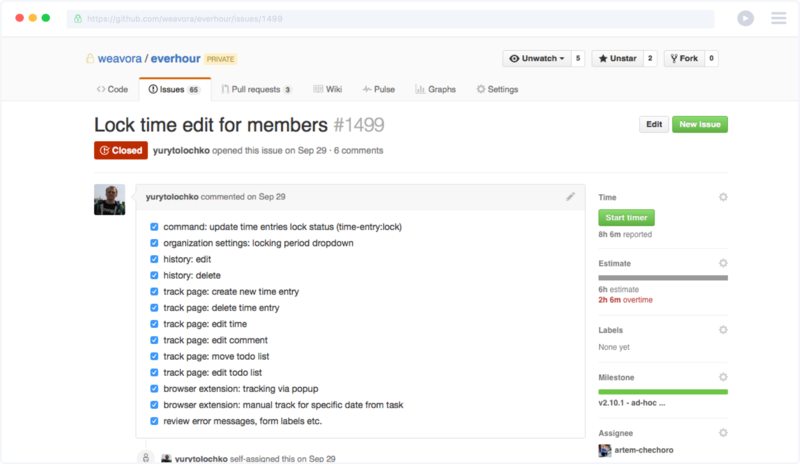 In GitHub, you will be able to track time on issues or pull requests. It feels like if time tracking is built right inside of these tools. While using it in browser you can easily start and stop timers with just a click and get back to work. 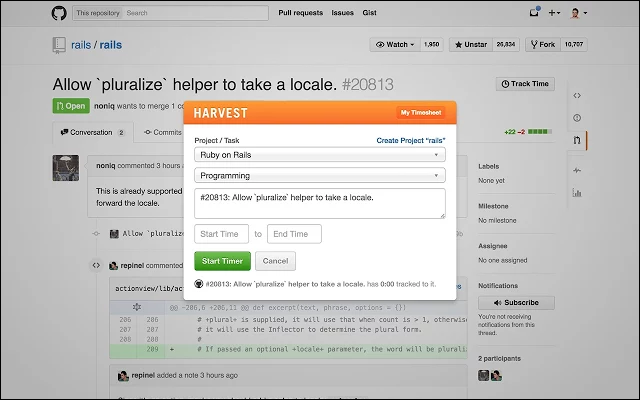 Project managers will thank Harvest because they can have it automatically remind the team to submit their timesheets. While it also gives them the ability to open up the projects dashboard and clearly gain the insights into the time status of their projects. Timely is another in the line of time tracking tools, but one that takes a slightly different approach. What makes Timely different is that is combines scheduling and time tracking all in one place. Whether you’re an individual or part of a company, Timely will give you complete control over when you worked, for who, and how much they owe you. With Timely, your schedule is your timer. 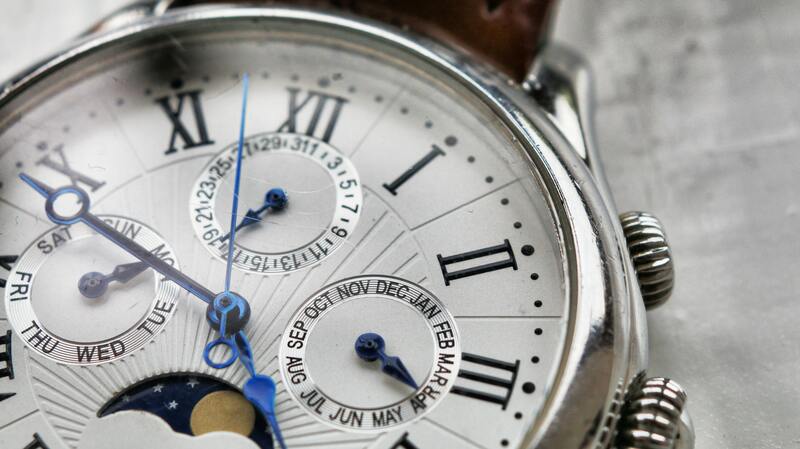 You simply plan out your days and are able to start logging your time simultaneously. If you need to move things around, the drag and drop feature allows you to move time blocks effortlessly. As your timers run for each time block, you can clearly see how much time (and money) you’ve logged versus what you planned. Reporting in Timely offers filtering options and the ability to export to Excel or PDF. Timely also includes integrations to all your favorite calendars so all your meetings and planned events are automatically imported. It even has apps for iOS and the Apple Watch when you’re on the go. No matter how easy a time tracker is to use, the one main problem with all time trackers is that if you don’t turn it on, it just doesn’t work. 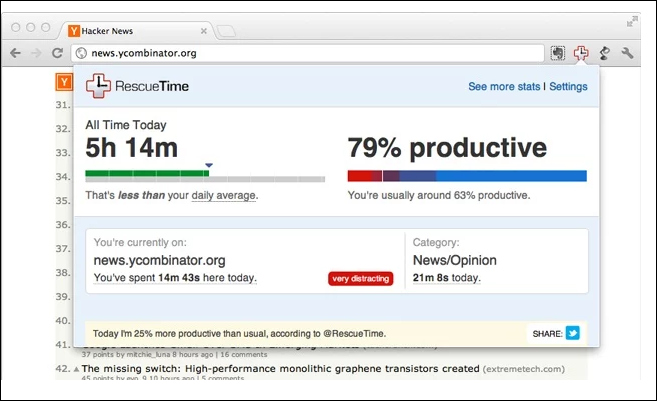 That’s where RescueTime is unlike anything else. It uses automatic time tracking by running in the background of your computer to track everything you do—from programs to websites. It essentially gives you a clear picture of what you were actually doing all day, week, or month, thus realizing how productive you really are. This is how it lets you make informed decisions on how to better manage your daily work. RescueTime does its best to auto-categorize the sites you visit. It also scores them on a scale from Very Productive to Very Distracting. You can easily fine-tune the defaults to suit your needs. It is smart enough to sense when you walk away from your computer for a few minutes, and then it automatically figures out when you’re away and stops tracking. Pricing: With free plan you can track time and set goals. If you want to add on features (e.g. site-blocking), it will cost you $9/month. In your constant effort to staying productive, time could be your main driver. But first, you would need to be more aware of where and how you spend your time during your daily work routines, or at least while you’re doing stuff on the web. This is where the Chrome extension, Limitless comes in. Apart from turning the new tab into a dashboard with gorgeous photography and inspiring quotes in the background, it essentially shows where your time is being wasted. 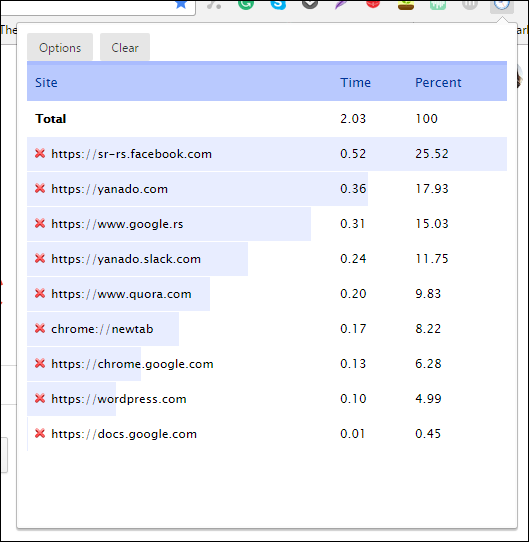 It tracks and categorizes your browsing habits, providing you with detailed analytics for each category with the amount of time spent and the overall percentage of your browsing productivity. It also comes with a smart notepad where you can quickly write out to-dos, reminders, and countdowns. Pricing: It is free for most of the features. If you want to use weekly / monthly / yearly productivity reports you will have to upgrade to Premium. Timecamp comes with the full set of features you’d expect to get from a time tracking tool, and it is specifically designed to meet the needs of both individuals and teams. It makes it possible for you to get an eye on how much time you spend while working on documents, websites and applications. 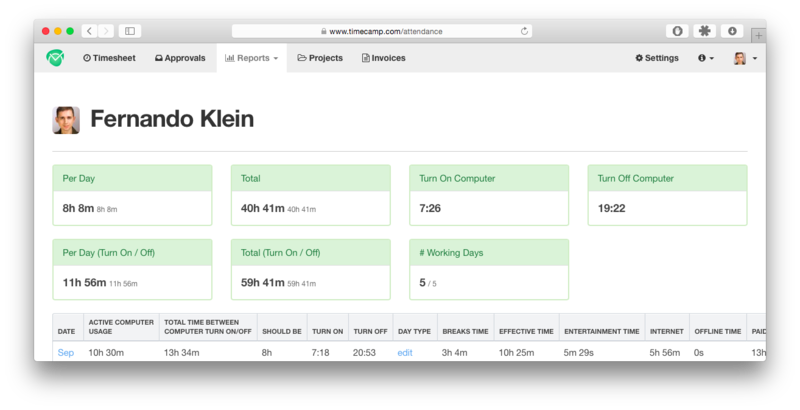 Tracking time with Timecamp is as easy as a one click action to start a timer or log the time manually using the streamlined interface. 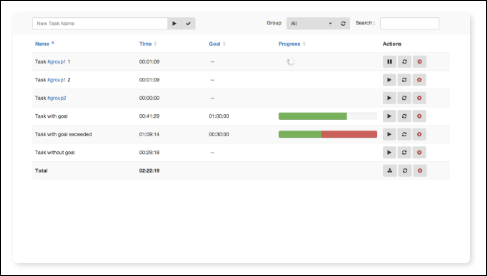 It lets you track time for grouped list of all your projects and tasks by monitoring the time visually with the graphical timesheet. It also has timesheet approvals, attendance reports that give you insights into the attendance of your team members, together with absence analysis, start and finish work time analysis. You can also track the historical data of estimated and actual time in order to make informed decisions when predicting and estimating your projects. 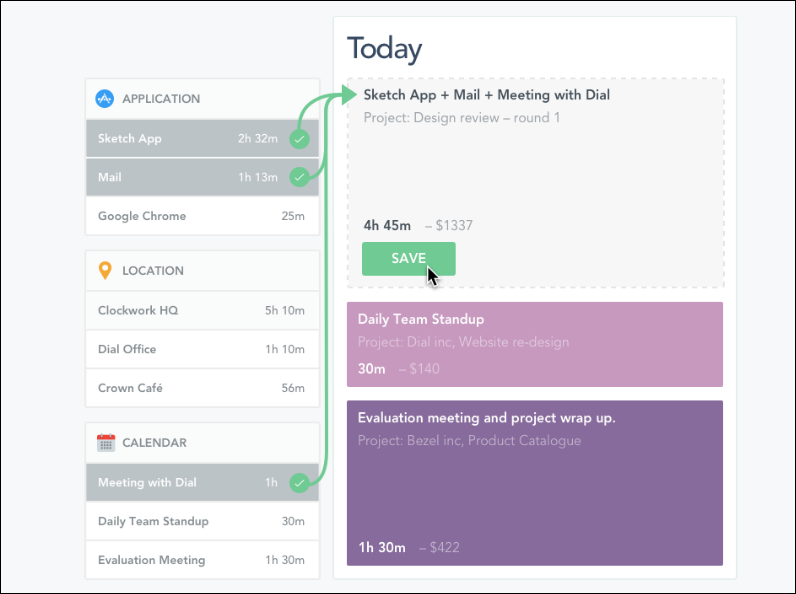 With its desktop app you can track all your activities during the day and assign them to the right projects later. Or you can set up keywords based on which the TimeCamp auto-assigns your activities to the appropriate projects. It also comes with the offline time tracking feature that lets you track the amount of time spent on a project working away from the computer. It does a pretty good job for managing billable hours using time entries based on which you can quickly create invoices. 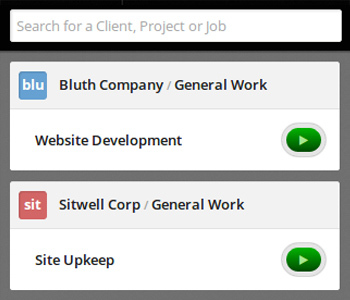 Using filters you can track the time spent on different clients and different projects per client. TimeCamp works on Windows, Mac and Ubuntu. It has native apps for iPhone and Android as well as a Chrome extension and it includes a handful of great integrations with other similar tools like Trello, Podio, Asana, Wunderlist, Basecamp, JIRA, GitHub, WordPress, Pipedrive and others. Pricing: Free for single users including essentials features. Basic plan ($6/user/month) for Small Agencies and Business Owners. Pro plan ($9/user/month) for Medium and Big Companies.